How goes your wedding/post wedding/just-need-to-get-in-shape fitness routines?! I’m in week 3 of my renewed fitness motivation, after I found out I gained 10lbs and 2 inches everywhere since the honeymoon (you can read more on that here! ) and I’m happy to say I think I’ve gotten back into the swing of things! I’ve done hour long weight sessions with my trainer 2-3 times per week, along with cardio the other 2-3 times so that I at least am working out 5 days per week. My trainer has been making me to do these uphill sprints between each circuit (so two minutes on speed 7 incline and incline 6 – ya I thought I was going to die) and I believe that any interval training is most effective for getting results, so I’m trying to do that in my cardio sessions as well. But more importantly is that I’m eating healthy foods again! (Uh no more tubs of ice cream and bags of chips lol sigh). Just lots of fruits and veggies, chicken breast and salmon, and water water water! I nervously stepped on the scale yesterday morning and I was so happy to see that I had lost 4lbs! It felt really good because I’ve been working so hard to get back to my wedding weight, and to know that the 4lbs lost wasn’t through any sort of fad diet or fancy systems, just simple eating well and working out. As they say: it’s not the work that’s hard; its the discipline. I think my best advice as to how to stay on track is by being prepared. I wrote on our chalkboard wall at home: “Be prepared or prepare to FAIL.” Lol yes, I know, a tad aggressive but it’s so true! 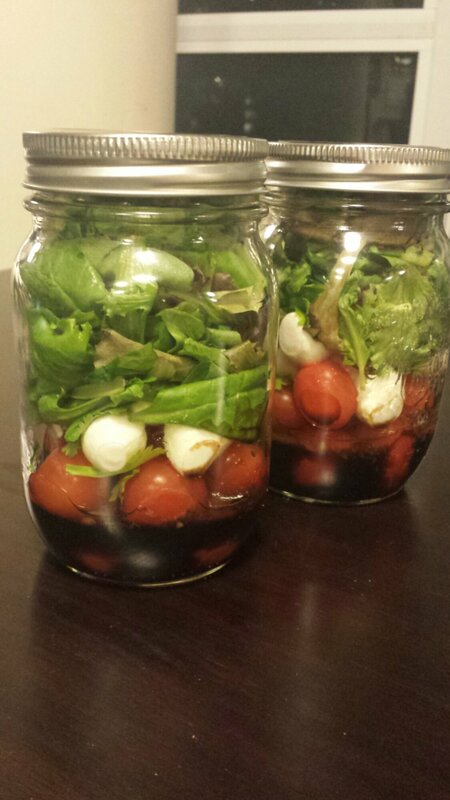 If you have pre-made salads in the fridge to take to work (I’ve been making them in mason jars, they stay fresher and look cute), then you will reach for them instead of buying something for lunch that will most likely be unhealthy. If you take out chicken the night before and think about what to cook, you’ll have a plan for a healthy dinner (also: get the hubby to cook healthy stuff – SM makes great salmon!). And if you put all of your gym sessions in your calendar as appointments, then there is more of a chance that you will treat them as such and go! All of these tips have everything to do with the preparation required to set yourseld up to be disciplined. How are you girls doing? How do you stay motivated? What are your dessert substitutes? How do you keep the weight off after you lose it?! So many questions!